From left, Kaley Johnson, Kendall Johnson, and Lisa Langer meet AWC’s Great Horned Owl at last year’s Wild About Chocolate gala. Photo special to the Journal. Sweet treats, music, auctions and close encounters of the feathered kind will highlight this year’s Wild About Chocolate gala. 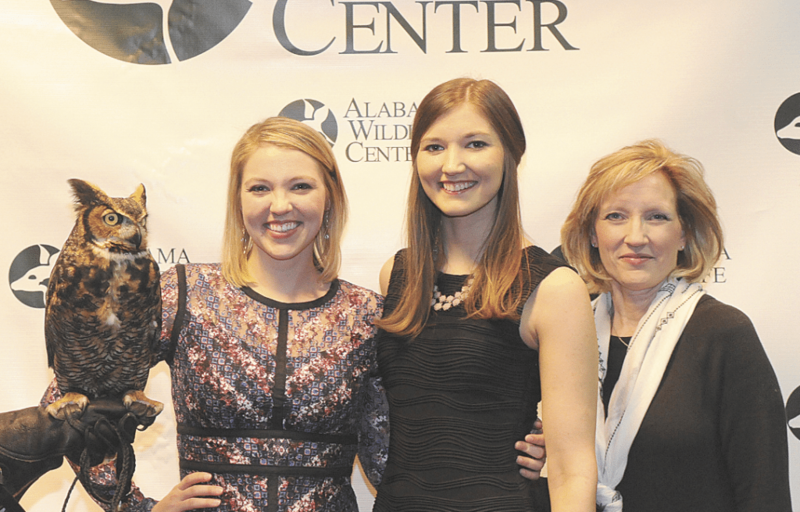 The annual Valentine gala, being held Feb. 11 at the Harbert Center, benefits the Alabama Wildlife Center and “has grown into one of Birmingham’s premiere Valentine’s Day events,” said AWC’s director, Doug Adair. This is the 13th year AWC has presented Wild About Chocolate, and it marks the center’s 40th anniversary. Brenda Ladun will be the emcee for the evening, while the band High Tide will chime in with live music. Birmingham’s best restaurants and caterers will provide refreshments. In addition, items from African safaris to flight lessons will be up for grabs in live and silent auctions. This year’s gala also will star two special guests: the center’s newest education ambassador birds, an eastern screech owl and a Eurasian eagle owl. They’ll be a striking pair. The screech owl is Alabama’s smallest owl, while the eagle owl is the largest owl in the world. Both birds are rescues; their stories underscore the importance of AWC’s work. After suffering eye and wing injuries in a car accident, the screech owl was taken in by AWC, but was unable to be released. She now has a new career educating groups statewide. The eagle owl was rescued from a negligent owner out west, then transferred to AWC from the Teton Raptor Center in Wyoming. Wild About Chocolate guests will be able to meet both of these beautiful birds in addition to other glove-trained ambassador raptors. Event proceeds will go toward care for all of AWC’s birds, as well as statewide conservation education programs and upkeep of the center. Gala tickets will be $75 in advance and $100 at the door. They can be reserved by visiting awrc.org, or by calling 663-7930.